Design Your Creatively Awesome Documents in Minutes! This exclusive offer is designed for webmasters, forum moderators, bloggers and administers of Facebook/Twitter page/YouTube channel who would love to get our great software for FREE! What will you get from PearlMountain? You can get a review copy of Publisher Plus for free. If you want to launch a giveaway to attract more readers and fans, we would also be happy to sponsor our software. What will you benefit from the campaign? You can post an article with marvelous page layout designs created by Publisher Plus to attract more potential visitors. It would be something that really resonates well with present readers too. Spur inspiration from the hundreds of amazing templates. Manage contents with tons of art resources and various objects. Refine document using the powerful editing features. How to Join the Exclusive Giveaway Offer? Have a free trial by clicking “Download Free Trail” button above, compose a high quality review for Publisher Plus for Mac and publish it on your site. It would be much appreciated if you place a backlink to our site in the review post. We also appreciate it if you share your review on YouTube / Facebook / Twitter / Google plus, other social networks, etc. Contact Us for Free license Codes. To win the license code for Publisher Plus for Mac, please email us with the related review post URL. In this case, your license key will be valid as long as the review post is on your site. If you want to be a partner of us, please just contact us right now! "A fully-featured and user-friendly desktop publishing and page layout application specially made for novice and experienced users." 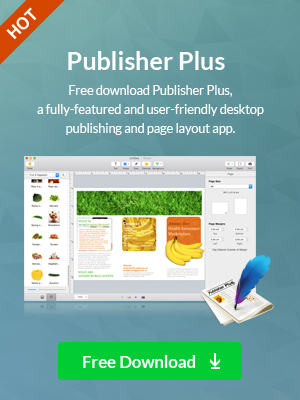 At the low end of the pricing scale for desktop publishing apps is Publisher Plus. This is a new entry but not exactly short on features, despite the price tag. I am always interested in any app that empowers me to create stunning flyers, brochures, reports, and more. Of course, the drawback is not all of them are easy to use. The main differences are that Publisher Plus is a touch faster to use, because it doesn’t hide options behind menus. The benefit is a bunch of good templates to use where you just enter your personalized text.